The new study from the lab of David Lodge, The Ludmilla F. and Stephen J. Galla Professor of Biological Sciences, and freely available online in the journal Methods in Ecology and Evolution, compared performance across centrifugation and filter pore sizes from 0.2 to 180 micrometers. It also provides a simple equation for calculating combinations of filter pore size and water volume to capture equivalent amounts of eDNA. 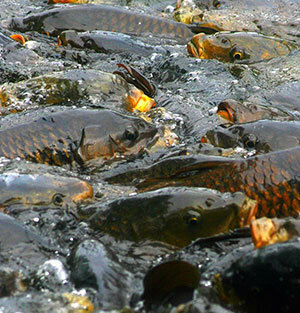 The scientists used a highly specific quantitative PCR test to measure carp eDNA, but they also quantified total eDNA — the DNA from any species — and found it was most concentrated in particles smaller than 1 micrometer. Because abundant total eDNA can interfere with the detection of eDNA from a rare species, this result further recommends the use of filter pore sizes greater than 1 micrometer. Originally published by William G. Gilroy at news.nd.edu on May 16, 2014.